Sense the tranquil hum of rain falling on a lake in the woods with this graceful, elegantly shaped fountain. The Rosabell tabletop fountain will bring the same aura of peace and calm to an indoor space as a larger fountain would, but can fit on a small table. 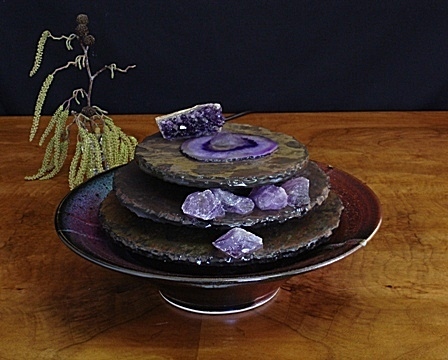 Features beautiful handmade bowl by a local artist from Melbourne, agate slice and amethyst cluster on top of three tier slate with rough amethyst rocks setting. Amethyst clusters points and rocks are very beneficial to use in healing and to heal negativity in the home or office everyone will be feeling calmer. Using an Amethyst as a meditation focus will increase the positive spiritual feelings. Amethyst helps overcome fears and cravings. It also helps relieve headaches.